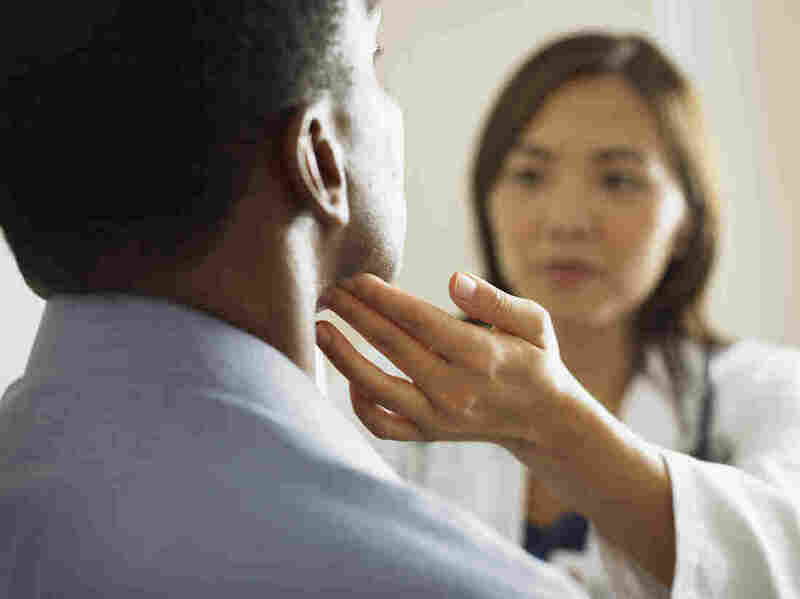 Racial Disparities In Cancer Deaths Is Narrowing Between Blacks And Whites : Shots - Health News African-Americans still have the highest death rate and the lowest survival rate of any U.S. racial or ethnic group for most cancers. But the "cancer gap" between blacks and whites is shrinking. Dramatic decreases in deaths from lung cancer among African-Americans were particularly notable, according to the American Cancer Society. African-Americans still bear a disproportionate share of the cancer burden in the U.S., having the highest death rate and the lowest survival rate of any racial or ethnic group for most cancers. "In 2019, approximately 202,260 new cases of cancer and 73,030 cancer deaths are expected to occur among blacks in the United States," the analysis by ACS investigators notes. But their report also shows that the gap between blacks and whites has closed considerably over the past few decades when it comes to lung, prostate and colorectal cancers. In fact, during the period from 2006 to 2015, overall death rates from cancer declined 2.6 percent per year among black men, compared to 1.6 percent per year among white men. Among women, for that same time period, death rates from cancer declined 1.5 percent per year among blacks compared to 1.3 percent per year among whites. "Twenty‐five years of continuous declines in the cancer death rate among black individuals translates to more than 462,000 fewer cancer deaths," according to the report's authors. The improvement among African-Americans is largely due to dramatic decreases in incidence and death from lung cancer, says Dr. J. Leonard Lichtenfeld, acting chief medical officer for the American Cancer Society, and that likely reflects the steep declines in the prevalence of smoking. "I can't say why smoking has decreased so dramatically in the black community but the fact that it has is very good news," he says. "It has significantly narrowed the gap between blacks and whites and we are very grateful." Still, racial disparities in cancer continue. The reasons are likely multiple, Lichtenfeld notes, and include disparities in education, socioeconomic status and access to health care. When the U.S. ensures that everyone has equal access to good health care, screening and treatment, Lichtenfield says, "we'll see even greater success. We have to make a commitment to make that happen."